Most recently, I was working in a climate I found personally challenging. There was bad behavior, excessive secrecy and politics, dishonesty…And the impact of all this was that the very loyal corps of employees were increasingly demoralized and fearful, which in turn negatively affected innovation and productivity. As I was interviewing one of the employees, trying to put them at ease but also surface important data, I asked ‘what’s your ideal vision for what happens next? What’s your dream?’ And that triggered me to pull Appreciative Inquiry by from the shelf. Although I’m a natural born problem solver, using positive psychology with this client system gave us all the room to discuss the undiscussable, without devolving into more bad behavior or getting mired in negativity. 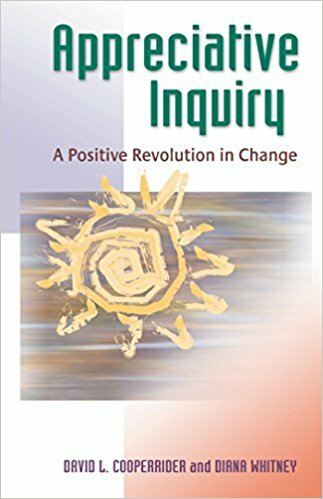 A truly revolutionary method of change management, Appreciative Inquiry (AI) emphasizes inquiry into strengths, rather than focusing exclusively on fixing weaknesses. Written by the originators and leaders of the AI movement, this accessible guide offers a practical introduction to the method, which has been used to significantly enhance customer satisfaction, cost competitiveness, revenues, profits, and employee engagement, as well as organizations' abilities to meet the needs of society. Full of exciting stories that illustrate its many applications and benefits, this is the most authoritative guide to Al. By using this change method to systematically tap human potential, organizations, communities, and individuals become more effective.